Caig DeoxIT D5 contact cleaner, 5-ounce spray can. Scratchy sliders, intermittent slide switches, an dirty connectors can be cured in seconds with a shot of mojo from this can! 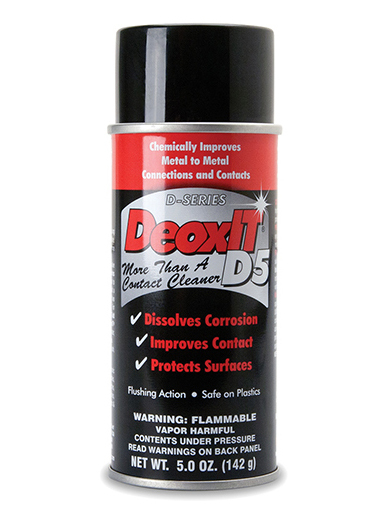 DeoxIT is a fast-acting deoxidizing solution designed for treating connectors, contacts, and other metal surfaces, and is ideal for cleaning and lubricating rotary and slide potentiometers. DeoxIT chemically improves electrical connections, and reduces arcing and RFI as well as wear and abrasion. It is safe for use on all metal connectors and contacts and will not harm plastics.